This is the exciting tag line you might customize! Voice-oriented sites provide blogs for faculty, students, and student groups. But just calling them “blogs” actually understates what’s really happening. It’s a personal publishing to develop their own digital identity and portfolio. These are effectively e-portfolios. These sites enable faculty and students to develop their own authentic voice on the open World Wide Web. The content is that of the authors. They own it. They control it. They can even easily take all of their content and migrate it to a different host that they choose or to a different domain name they own. It’s their voice. Our neighbors in town, Michigan State University, has started their own Domains of One’s Own project similar to ours to provide 21st century publishing platforms for their scholars. Here’s Dean Long of MSU explaining the concept of crafting your own digital scholarly presence. socially embedded, interest-driven, and oriented toward educational, economic, or political opportunity. Connected learning is realized when a young person pursues a personal interest or passion with the support of friends and caring adults, and is in turn able to link learning and interest to academic achievement, career possibilities, or civic engagement. The Web enables students, faculty, and staff to make connections easier then ever: connections with other people, connections with other ideas, and connections across all of their learning activities. Indeed, the essence of integrated general education is helping students to make connections between what they learn in different classes. It’s hard to make connections and integrate ideas when each class is experienced as separate, silo-ed, time-limited event built around the traditional 16 week small classroom. The LCC Open Learning Lab enables and is creating new designs for sites that enable faculty, staff, groups, and students – all the members of the LCC scholarly community – to create connections. 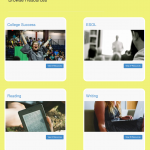 Connected courses – websites that enable students in different class/courses to work together or share a project, a dis cussion, an assignment, or just resources. Connected students – We can create social websites for groups. 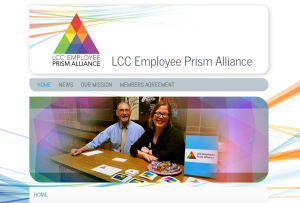 The first one on the OpenLCC.net commons is for Prism, the LCC LGBQT Employee alliance. We’re discussing creating similar sites for student groups and clubs. Connected students and alumni – We’re working on adapting an idea from University of Birmingham (UK). At U Birmingham, they’ve built a WordPress/BudddyPress social site that connects alumni to current students and facilitates development of mentor relationships. We believe we can adapt their setup to our programs. Imagine what if your successful current alumni, regardless of where they may be, can connect and develop relationships with current students. The possibilities are exciting. A distinguishing feature of the emerging 21st century digital learning ecosystem is sharing. Like the Web itself which was built and created with open source software, such as Linux, Apache, and WordPress (what we use!) and collaboratively-developed, openly shared technology standards such as HTML, CSS, and HTTP protocols, open learning is built on sharing. A first step toward sharing is the adoption and sharing of OER, Open Educational Resources. OER’s are so important that LCC has a separate project devoted to OER adoption. But education and learning is more than just textbooks and written resources. The Open Learn Lab is actively developing websites that facilitate sharing ideas. 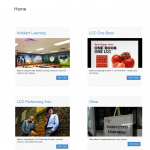 One of the more interesting sites is the CTE Ideas Bank for sharing teaching ideas and techniques for teaching using the LCC Performing Arts or OneBook LCC program or the ideas for inclusion. The Ideasbank enables faculty to share, find, and discover techniques for better teaching. Another site we’ve developed is for the Center for Transitional Learning. Research showed there are relatively few OER repositories and resources for developmental and transitional learning faculty. They’re difficult to find, which in practical terms puts them beyond the reach of many faculty, particularly adjunct faculty, who simply don’t have the time to research and find the. Amy Larson of the LCC Center for Transitional Learning has done the research and assembled a repository of over 100 different OER resources for Transitional Learning. We helped Amy develop a site to facilitate sharing these ideas and resources with faculty. 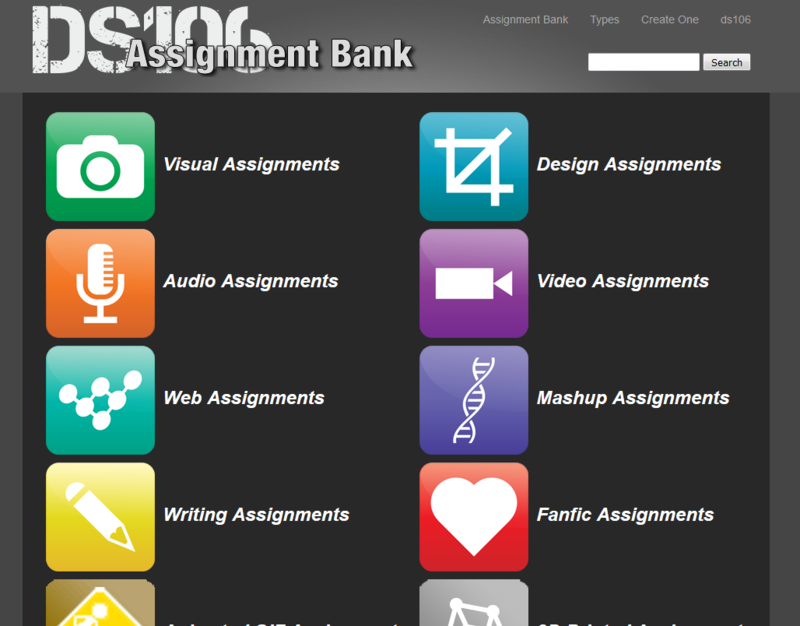 The basis of these sharing sites is an assignment bank-oriented WordPress site/theme that was developed by University of Mary Washington for the DS106 Digital Storytelling MOOC (Massively Open Online Course). DS106 is one of the original connectivist MOOC’s that started the MOOC movement. We’ve taken the DS106 theme (open sourced software for WordPress) and adapted it to LCC faculty needs. The Open Learn Lab is working on two evolutions/directions for sharing oriented sites. One idea is to adapt the CTE Ideasbank into smaller program-specific ideas banks where faculty in each program can discuss and share ideas and techniques for teaching particular topics, exercises, problems, outcomes, etc. We’re looking at then connecting these sites (the technical term is syndication) so the ideas then feed into and are discoverable from the main CTE Ideasbank hub. At the same time, each program ideas bank could be combined with a social-oriented private discussion site where faculty within a program can engage in both synchronous and asynchronous discussion of how to teach. It’s not a replacement for meetings, but could leverage face-to-face meetings and help engage more adjunct faculty. A second experimental direction is the creation of a crowd-sourced micro-tutorials and how-to pages or explanations. Such sites would be based on the “choral explanations” concept of Mike Caulfield of Washington State University. We’re initially trying to experiment with the concept for a help site for users of the OpenLCC.net sites. But the concept could be expanded to student- and faculty-created FAQ sites, glossaries, and micro-tutorials/explanations for course subjects too. Students are not just passive consumers of information. Integrated liberal education requires students to become active creators of their own work and their own learning. Thus, one of the most important High Impact Practices in higher education is the concept of the Signature Work. In addition, David Wiley in explaining how OER leads to Open Pedagogy has also identified the concept and importance of authentic assignments which stand in contrast to the older concept of disposable assignments. Finally, regardless of whether they are transfer oriented students or students in a career-focused program, students need to do assignments that prepare them for the actual work they will do in the next phases of their careers. The Open Learn Lab is pioneering in developing websites and pedagogical designs to support students ability to create. In several Writing classes, Professors Leslie Johnson, Carol Kendy, and Nichole Biber have pioneered with sites we’ve helped to develop. These sites are what we playfully call “SPLAT’s” for Single Purpose Learning Assignment Thingies. It’s a similar concept to the SPLOT’s that were developed last year at Thompson Rivers University in BC by Brian Lamb and Alan Levine. In a SPLAT, students in complete a writing assignment by writing a post or page on a public website instead of submitting the traditional paper-based document or MS Word-based document file. Traditional assignments tend to be disposable assignments in Wiley’s terms, meaning students don’t take them as seriously, they have difficulties imagining or writing for an audience different from the professor, and know that nobody but the prof will likely ever read what they write. Instead, in a SPLAT, the student learns to write for the open Web. They become a “published author” with potentially real readers beyond the classroom and the writing itself lasts longer. The prototype for our SPLAT’s is an assignment developed by Leslie Johnson for the Transforming Learning Through Teaching faculty development course in the CTE. 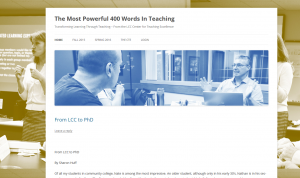 This site is called 400 Words after the capstone assignment for faculty to write a 400 word essay about an experience with a student that illustrates teaching and the college mission. (warning there are some awesome stories at 400 Words! – some may move you to tears). In one of our latest creations, we’ve created a syndicated course hub for BIOL 125 taught by Meg Elias. Each student has their own blog website on Voice.Openlcc.net. The complete some course sites by creating posts on their blogs. Those posts, already publicly available material, are then copied/syndicated into the course hub automatically so all students can read each others’ posts. This connected course design is an example of how student blogs, which are essentially e-portfolios, can be integrated with course assignments. Two directions we’re currently working on are real-world writing environments and integrated, across-courses SPLAT’s. An example of a real-world writing assignment is one we’re helping to develop for Mindy Wilson. Professor Wilson teaches a biology laboratory-based course for students who will likely become biology lab techs in modern research laboratories. Historically lab technicians have always kept written lab notes in a paper notebook. And that’s the way it’s been taught. But in the real world today, modern corporate labs don’t use paper notebooks. Real-world lab techs keep their notes in online content mgt systems. We are working to develop a WordPress-based design that can mimic the kind of online systems technicians will likely use after graduation. In the class, students will write their notes online in the lab using this WordPress Open Learn Lab site. As we refine this site, the structure should be such that we can relatively easily adapt the concept and site to other courses where students face writing tasks online in the real world. The other direction we’re working on is using SPLAT’s for integrated general education. The concept here would be that two professors in different courses, say a writing course and a science course, could use the same writing assignment using the same SPLAT. The two professors could use different rubrics to assess the same assignment. In this way students get to write on subjects meaningful to them and they connect the writing instruction with the science instruction. (if embedded presentation fails to display in your browser, use this link to open in new tab.